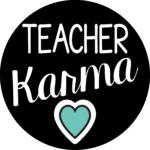 You are here: Home / All Freebies / Flexible Seating Freebie – Click and GET! Learn how to implement flexible seating into your classroom with this Flexible Seating Freebie. Interested in trying flexible seating in your classroom? Flexible seating is being implemented around the globe with raving reviews from classroom teachers, students, and even families. 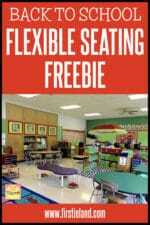 Click here to access your Flexible Seating FREEBIE. If you haven’t tried using flexible seating in your classroom, you need to download the free flexible seating starter kit. 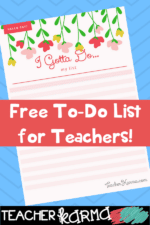 Or, if you have tried to use flexible seating with your students and it’s not going so well… you know what I mean… this free resource is worth giving a try. 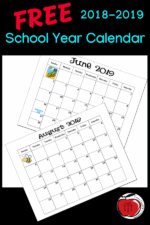 It is perfect for adding to your classroom management toolbox. How to start with flexible seating? When you are first starting out with flexible seating, you will want to set up your student expectations so they will know what to expect. If you don’t set up specific expectations ahead of time, it will not be fun. For anyone. 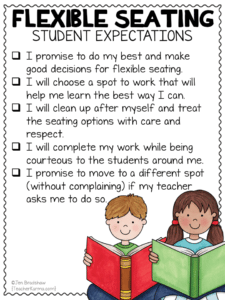 Get your FREE flexible seating student expectation anchor chart here. Let parents know what to expect. Send a flexible seating notification letter that explains what it is, why you’re using it, and how their children will be positively affected. The freebie includes a parent letter as well. 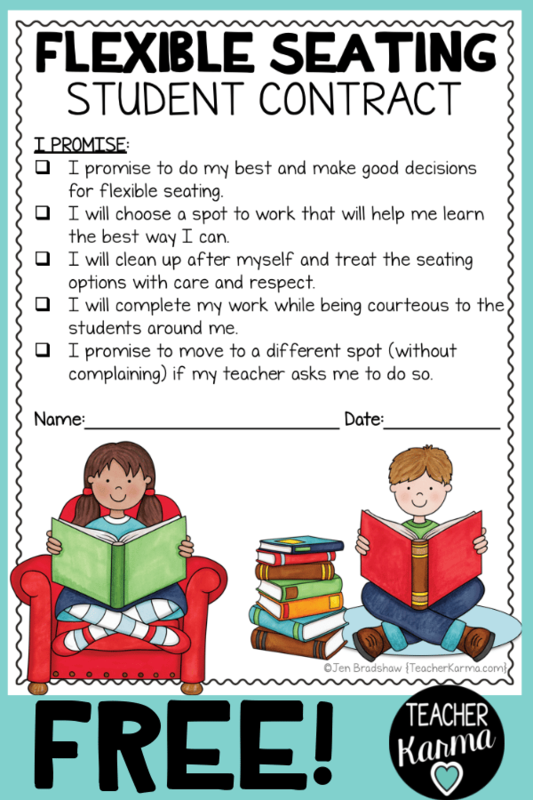 Have students sign a flexible seating contract that hits all of the student expectation statements. My free flexible seating resource has this as well. You can even have a flexible seating signing ceremony. Make a big deal of it. Your students will love it! Use a tracking form so students can document their seating choices and make notes about how it has affected their learning. Click here to read more about flexible seating chairs and get your FREE Flexible Seating Starter Kit.